Knee pain, swelling, stiffness, and difficulty extending the knee are symptoms of a meniscus tear. The meniscus is the cartilage in our knees that allows for easy movement of the legs. It helps your knee turn and carry weight. A meniscus tear is among the most common of knee injuries, particularly for those who play sports. Carpal tunnel is caused by a pinched nerve in the wrist. Symptoms include recurring numbness, tingling, weakness, or pain in your fingers – most commonly caused by overuse of your hands, arms, and fingers for repetitive tasks. Signs of a rotator cuff tear include pain and stiffness when attempting to move your shoulder or raise your arm. A rotator cuff tear typically occurs in people who repeatedly perform the same shoulder motions, such as throwing a ball. Treatment may include rest, medication, physical therapy, corticosteroid injections, or possibly surgery. Plantar fasciitis is the most common reason for heel pain. It is caused by repeatedly stressing the plantar fascia, which is the ligament that connects the heel bone to the toes and supports the foot arch. An ACL tear involves tearing the anterior cruciate ligament, which is the ligament that runs through the middle of the knee. The ACL provides stability and keeps bones in place. ACL tears usually occur during activities that involve quick stops and starts or turns. Also known as golfer’s elbow, tennis elbow is caused when the tendons around the elbow get irritated and inflamed, causing pain. Tennis elbow is often caused by overuse of the muscles in the arm, forearm, and hand. Ankle and foot sprains often occur when the foot or ankle is quickly twisted or turned, therefore, stretching or tearing the fibrous tissue supporting the foot and ankle. A stress fracture is an injury that results from overuse – simply too much stress and wear. When muscles get tired and weak, they reduce their ability to protect the bones from impact. When the muscles and bones are impacted over and over again, they can crack or fracture. A dislocated shoulder, also known as a labrum tear, typically causes severe pain and if often visibly noticeable. Accidents and sports injuries are often the cause of a shoulder dislocation. Unfortunately, once your shoulder is dislocated, it is more prone to dislocate again. Wrist fractures are most often caused by a fall. 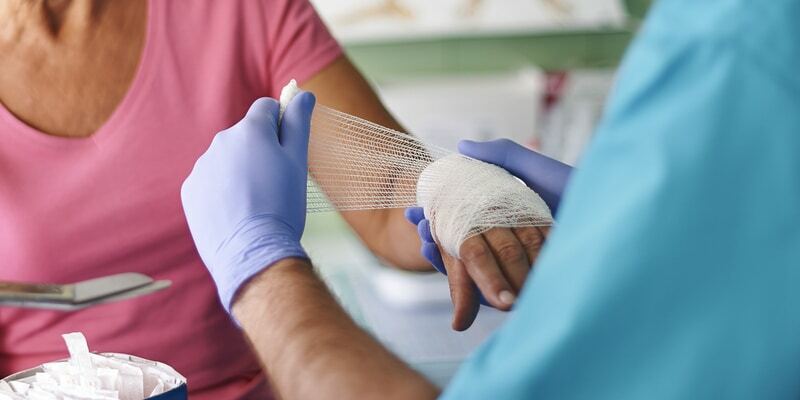 Treatment options include immobilizing the wrist with a cast or, in some more serious cases, surgery. When you need us, we’re here because at The Orthopedic Clinic, we want you to live your life in full motion. Just walk right in and an orthopedic specialist will be ready to help you get on the road to recovery. Receive one stop, expert, orthopedic walk-in care today. Visit 1075 Mason Avenue, Daytona Beach, FL, 11:00 AM to 7:00 PM. Or call us right away at (386) 255-4596.